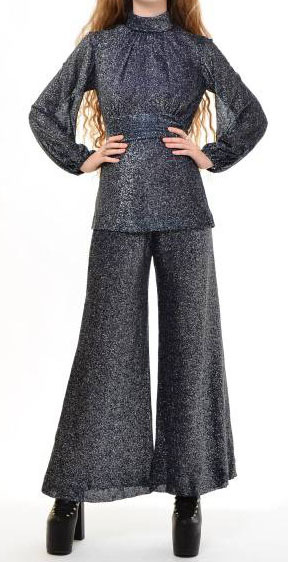 70s Disco Suits. 70s Disco Pants. 70s Jonathan Logan two-piece outfit. Dark blue with silver sparkly metallic threading throughout. Top has sheer poet sleeves with elasticized cuffs. Extra-high collar with long zipper closure on back. 70s Halston strapless top and harem pants that can be combined together for a jumsuit look or mixed and matched.